﻿On the outside, Hinata Asahi's life seems happy enough. She does well at school and has friends that care about her. She sees the sunny side of every situation and is always trying to cheer up the melancholy people that she's around. Nothing seems to faze this girl. But a closer look reveals that perhaps her life isn't as perfect as it could be. Every night, Hina goes home to an empty house, with only her teddy bears waiting at the door for her. It's alluded to that she's moved out of her father's home because she wants him to be happy, but how could such a wonderful girl be bringing him sadness? Early on in the volume, Hina gets a next-door neighbor. The house has been standing empty for awhile, so Hina is curious to see who might be living there. Shiro Asou is a young man who has just moved into the area, and as a matter of fact, is taking over for Hina's homeroom teacher. Hina is elated to have found a new friend, and promptly starts inviting him over for meals and the like. But a few side conversations we overhear Shiro having leaves us wondering if there's more to him than meets the eye. 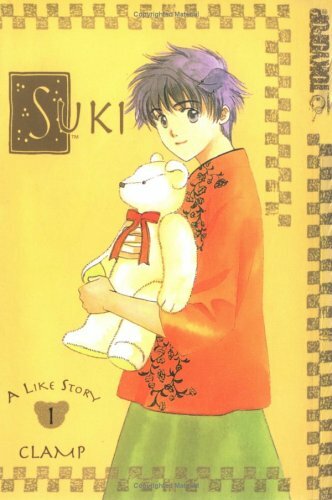 Suki: A Like Story Volume 1 follows a lot of what has become traditional manga tropes. You have the perpetually cheerful girl, her retinue of friends, the older man to have a crush on, and the mystery of their backstory. The art is very 1990s shojo, and has many of the expected traits of a CLAMP title. In many ways, it's exactly what one would expect. What you have to remember, though, is there's nothing wrong with that. The reason that titles like Dragon Ball and Yotsuba&! come back again and again is that they are the comfort food of manga. You know what to expect when you start it, and it's a welcome break from titles like Attack on Titan and Berserk. CLAMP consistently delivers a certain level of excellence in each title they do, and Suki is no exception. Highs: Hina getting excited about her favorite author's new book is a feeling we're all very familiar with. Lows: The mystery around why she lives by herself is going to get old quickly. Verdict: A traditional shojo romance that is very well done.